A delicate flavour combining cereal notes with a subtle, sweet bubblegum fruitiness. 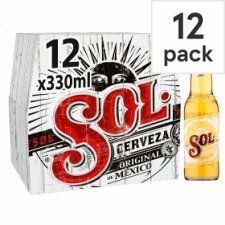 A very drinkable lager that does what it's designed for, to be enjoyed ice cold in the sun with friends. Put a lime wedge in the top of the bottle and it's the perfect BBQ accompaniment. Fast and crisp with hint of bubblegum sweetness. Corn chips with hints of lemon and bubblegum fruitines. Lightly sweet, delicate cereal and fruit notes. Light with husky crisp dryness. The original beer of Mexico since 1899. 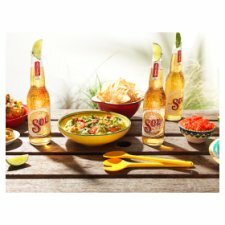 Born in 'El Salto del Agua' brewery near Mexico, SOL is an undeniable part of the Mexican spirit, and is a tribute to its deeply rooted culture. With nothing to hide, the independent spirit of SOL reveals a passionate journey to freedom - the freedom to choose and celebrate every day without pretence or compromise. Put a lime wedge in the top of the bottle and it's the perfect BBQ accompaniment. Best before end: see bottle back label.